New! We now offer two CD-ROMs with 1,100 editable certificates for $69! A $5,500 value! You'll need a Mac or Windows computer. Microsoft Word is required to edit certificate text. Click here to buy the Certificate Collection on 2 CD-ROMs. 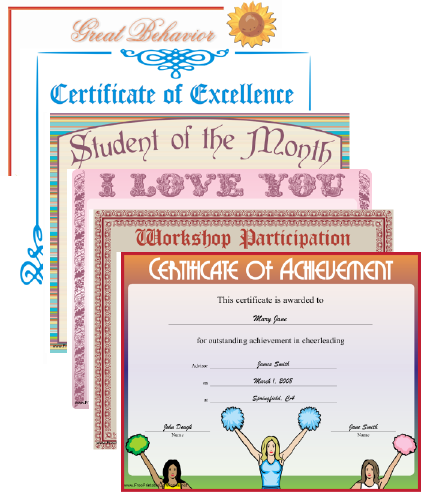 The Certificate Collection includes both PDF and Microsoft Word versions of 1,100 certificates, plus some surprise bonus printables! Certificates are licensed for your personal or organizational use. The digital versions may not be re-distributed.